In a rare move, a civil court judge ordered an incumbent county official's name to be removed from the general election ballot in November. 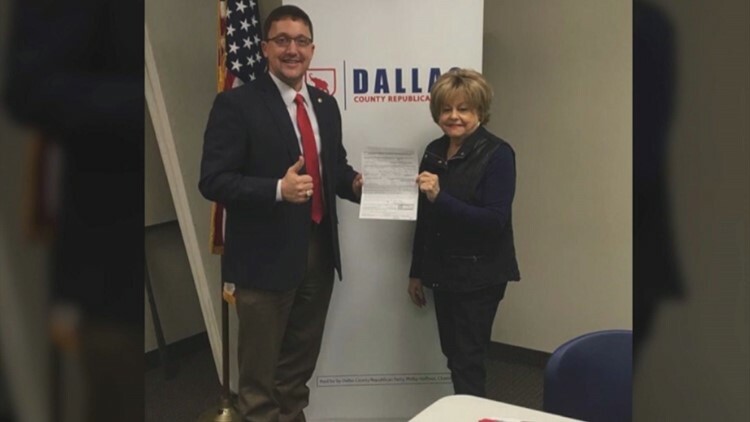 DALLAS — In a rare move, a civil court judge ordered an incumbent county official’s name to be removed from the general election ballot in November. Brian Hutcheson, the Dallas County Justice of the Peace for Precinct 2 in Garland, did not have enough signatures on his petition to get on the ballot, the judge ruled on Friday afternoon after a two-day trial. In February, a WFAA investigation revealed Hutcheson’s petition contained addresses that don’t exist and individuals who say someone signed their name without permission. Hutcheson, a Republican, had to collect 250 signatures to get on the ballot. Jerry D. Ray, a visiting judge from Palo Pinto County, ruled that only 245 of Hutcheson’s signatures were valid. “I’m very pleased with Judge Ray’s ruling. No one is above the law, Brian Hutcheson did not have 250 valid signatures for precinct 2 to qualify for the November election. To make matters worse, Mr. Hutcheson forged signatures on his petitions and made up fake addresses,” said Margaret O’Brien, the Democratic candidate who challenged Hutcheson’s petitions in court. Hutcheson has 30 days to appeal. He has not responded to a message from WFAA. The Dallas County Republican Party, which was also named in O’Brien’s complaint, said it has no plans to appeal Judge Ray’s ruling though he has not yet released his final order yet, according to Elizabeth Alvarez-Bingham, the party’s attorney. To get on the ballot in Texas, judicial candidates can pay a filing fee and then must collect a certain number of signatures from people who support their candidacy. But the list Hutcheson submitted contained multiple discrepancies. For example, there’s no such address as 3528 Casa Ridge or 3539 Casa Ridge in Mesquite, despite Hutcheson claiming he got people from those addresses to sign his petition. Judi King, who has lived on the block for 52 years, told WFAA those addresses do not exist. She also testified at the two-day trial. Another name on Hutcheson’s petition was “Brenda Rocha,” at 2209 John Gleen [sic] in Mesquite. But the family at 2209 John Glenn said it has never heard of that individual. And one name on his petition, Olga Diaz, has a birthday listed on Hutcheson’s form as 2008 – making her 10-years-old – ineligible to vote. Hutcheson’s petition shows that “Marco Alvarado” lives at 131 Danbury in Mesquite. But that’s Manuel Diaz’s place. Hutcheson swore to a notary that he got Alvarado’s signature on October 22, 2017. But Diaz, 38, told WFAA he has rented the home for more than a year and a half and no one by that name has ever lived there in that time. "Somebody had to have made it up because half of the information is correct, but the other half is not true,” Diaz told WFAA in February. He also testified at the trial this week. Hutcheson would not agree to an interview in February and he has not admitted any wrongdoing. A Republican JP in Tarrant County – Russ Casey – got caught doing the same thing in January. Casey dropped his re-election bid after WFAA exposed it.